(FIAT 46477717, 50005994, 7655732, 7738582. Function Temperature Switch, radiator fan. A1G) Saloon Diesel 04/1993 12/1997 FWD 8 125 92. A1) Saloon Petrol 03/1992 05/1995 FWD 12 165 121. A1E) Saloon Petrol 09/1992 12/1997 FWD 12 163 120. (FIAT 5992746 82436410. A2) Hatchback Petrol 10/1994 12/1996 FWD 8 103 76. A2) Hatchback Petrol 12/1996 01/2001 FWD 16 120 88. A1) Hatchback Petrol 10/1994 12/1996 FWD 16 129 95. A4E) Saloon Petrol 02/1992 05/1994 FWD 8 129 95. If your engine cooling fan isn't kicking in when the engine heats up and your coolant rises above the trigger temperature then you may have a faulty cooling fan switch. Housing Colour: Black. Temperature Range (°C): 92-82/97-92. LANCIA Y10 (156_) 1.0 Fire (156B, 156AD) Hatchback Petrol 06/1985 06/1991 FWD 8 44 32. Engine Code: 8140.43C. FIAT MAREA Weekend (185_) 1.4 80 12V Estate Petrol 09/1996 05/2002 FWD 12 80 59. Engine Code: 8140.43S. Heater Motors. Fan Couplings & Magnets. Belt Tensioner Wheels & Bkts. Suspension Ball Joints. Any claims after 24 hours cannot be accepted. Rear Lights. Temperature Switch. Front Exhausts Cats. ADD TO FAVOURITE. Always carefully compare OE number and pictures with your old part. Heater Motors. Fan Couplings & Magnets. Belt Tensioner Wheels & Bkts. Suspension Ball Joints. Any claims after 24 hours cannot be accepted. Rear Lights. Combi Switch Function: Lock. Temperature Switch. LANCIA DEDRA (835_) 1.6 LE Cat (835EB) Saloon Petrol 07/1994 07/1999 FWD 8 90 66. Engine Code: 146 D5.000, Driver Position: for left-hand drive vehicles. LANCIA Y10 (156_) 1.1 Fire All-wheel Drive (156AG) Hatchback Petrol 01/1995 12/1995 AWD 8 54 40. Part Number: DER01004. The role of the engine cooling fan is to increase the flow of cooling air that reaches the radiator. Using a full synthetic oil may help to reduce oil consumption if a mineral or semi-synthetic oil is being used. Heater Motors. Fan Couplings & Magnets. Belt Tensioner Wheels & Bkts. Suspension Ball Joints. Any claims after 24 hours cannot be accepted. Rear Lights. Colour: Black. Temperature Switch. This is an original quality part manufactured by Elta. FOR ALFA 155. Number Of Poles:2. Vehicle compatibility. Multiple choices exist for:ALFA 155 1.8 Coolant Temperature Switch. FOR ALFA 155. This is an original quality part manufactured by Lucas. PART CHOICE ALERT. FTS821.92 FAN SWITCH Fiat Croma, Tipo, Tempra, Uno. Manufacturer Part Number: FTS821.92. Application: Fiat Croma, Tipo, Tempra, Uno. Part Type: FAN SWITCH. We are proud to distribute their huge range of products matching OE quality and specification. Nissens 85100 Radiator Fan 145 (94-) 146 (94-) 155 (92-). Part No: 85100. Rice Rocket. ► Engine Cooling. © Rice Rocket. THE WIDEST PRODUCT RANGE. • Deep coverage of more than 90% of all market applications. New Genuine FIRST LINE Radiator Cooling Fan Temperature Switch FTS821.92 Top Quality 2yrs No Quibble Warranty. Heater Motors. Fan Couplings & Magnets. Suspension Ball Joints. Belt Tensioner Wheels & Bkts. Part No : 8EW 351 043-711. With Actuators from HELLA. More driving safety?. With our Radar solutions from HELLA no problem at all! Steering easily with HELLA Electrical Power Steering. Rice Rocket. The “feel-good” factor inside any vehicle: Interior lighting solutions from HELLA. If your engine cooling fan isn't kicking when the engine heats up and your coolant rises above the trigger temperature then you may have a faulty cooling fan switch. Housing Colour: Black. Connector Shape: Round. Lemark Radiator Fan Temperature Switch. Housing Colour: Black. Connector Shape: Round. Any information in the compatibility table is for reference only and there may be unspecified choice options. Labour claims & consequential loss claims are never accepted. Temperature Range [°C]: 87-92. They focus on availability, range, service and quality. QUINTON HAZELL: XEFS64. LUCAS: SNB730. FOR ALFA 155. This is an original quality part manufactured by Denso. Multiple choices exist for:ALFA 155 2.0 Coolant Temperature Switch. FOR ALFA 155. This is an original quality part manufactured by Lucas. Vehicle compatibility. PART CHOICE ALERT. Part Number: 85100. Fan, radiator. Rated Power [W]: 252. AVA QUALITY COOLING: FT7546. Engine Cooling. Body & Trim. (We can mark the item as a 'gift' if requested to, but we will not declare any different amount). FOR ALFA 155. This is an original quality part manufactured by Lucas. Number Of Poles:3. Vehicle compatibility. 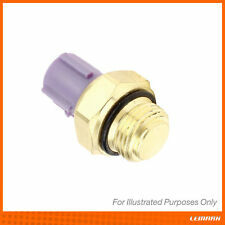 Multiple choices exist for:ALFA 155 1.8 Coolant Temperature Switch. FOR ALFA 155. This is an original quality part manufactured by Lucas. Vehicle compatibility. PART CHOICE ALERT.